The Entity Framework DbContext class uses a convention over configuration approach to development. When everything is working correctly, you can generate and populate a database just by writing a little bit of code and running “enable-migrations” and “update-database” from the Package Manager Console window in Visual Studio. No XML mapping or configuration files are required, see EF Code-Based Migrations Walkthrough for more details. When things do not work, the conventions are frustrating because they form an impenetrable fog of mystery. Of course, having everything explicitly configured isn’t always clearer or easier to troubleshoot, but here are some common problems I’ve observed with EF 4.1 – EF 5.0, and some steps you can take to avoid the problems. “System.Data.SqlClient.SqlException: A network-related or instance-specific error occurred while establishing a connection to SQL Server. These messages can happen at any stage, from enable-migrations, to update-database, to running the application. The key to getting past one of these messages is figuring out which database the framework is trying to reach, and then making that database available (or pointing the framework somewhere else). The first step I would recommend is trying to determine what connection string the framework is using, because the exception doesn’t tell you the connection string, and the connection string can be controlled by a variety of conventions, configurations, and code. To find out the connection string, I’d add some logging to a default constructor in my DbContext derived class. Run the application with the debugger and watch the Visual Studio Output window. Or, set a breakpoint and observe the ConnectionString property as you go somewhere in the application that tries to make a database connection. In the above output you can see I do not have a default SQLEXPRESS instance available (it would list itself as MSSQL$SQLEXPRESS), but I do have a default SQL Server instance installed (MSSQLSERVER – but it is not running). I’d have to start the service and give the Entity Framework an explicit connection string for this scenario to work (see Controlling Connections below). 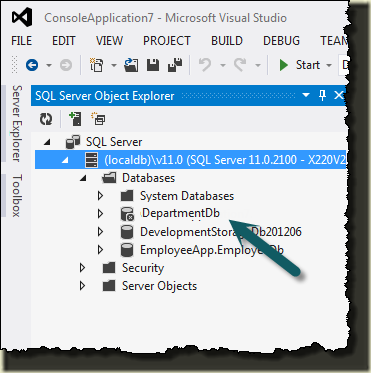 Visual Studio 2012 installs SQL Server LocalDb by default. LocalDb is the new SQL Express with some notable differences from SQL Express 2008. A LocalDb instance runs as a user process, requires a different connection string, and stores the system databases under your hidden AppData directory. Since LocalDb is a user process and not a service, you won’t see it listed in the output of the Get-Service command above. You can, however, run SqlLocalDb.exe from the package manager console (or the command line) to see if LocalDb is installed. (localdb)\v11.0 is the LocalDb connection string, and if you are not connecting to LocalDb then you might need to reinstall (here is a link that will eventually take you to the MSI file). Using the LocalDbConnectionFactory means you’ll no longer try to connect to SQL Express by default. There is also a connection factory for SQL Compact. You’ll find this factory in your config file if you install the EF SQL Compact NuGet package. System.Data.SqlClient.SqlException: Login failed for user ‘[Your account here]'. System.Data.SqlClient.SqlException (0x80131904): CREATE DATABASE permission denied in database 'master'. These permission issues can be hard to fix. The first thing I’d do is add some debugging code to verify the connection string being used by the Entity Framework (the debugging code demonstrated earlier). Once you know the server the Entity Framework is trying to reach you should try to login to the server with a management tool (like SQL Management Studio, which also works with LocalDb), if you can. The problem is you might not be able to login with your account. Even if you are an administrator on your local machine you might find yourself with limited privileges in your own, local SQL Server. One scenario where this can happen is when SQL Server or SQL Server Express is installed onto your machine by a different user, or you installed the software using a different account, or perhaps your machine was built from a cloned image file. As of SQL 2008, just being an administrator in Windows doesn’t make you a sysadmin in SQL Server. To fix the permission issues you can try to login to the server using the sa account, but of course you must know the password and the sa account must be enabled. You can also try to login to your machine using the Windows account used for the software installation. Once logged in with high privileges you’ll need to add your Windows login to the list of SQL Server logins and (ideally) put yourself in the sysadmin server role. When all else fails, you can try to regain control of SQL Server by starting the server in single user mode (see Connect to SQL Server When System Administrators Are Locked Out). The SQL Express blog also published a script to automate this process (see How to take ownership of your local SQL Server), which should also work with SQL 2012. The nuclear option, if you don’t care about any of the local databases, is to uninstall and reinstall SQL Server. Cannot attach the file ‘…\App_Data\DepartmentDb.mdf' as database 'DepartmentDb'. SqlException: Cannot open database "DepartmentDb" requested by the login. The login failed. In this case the database is still registered in LocalDb, so you’ll need to go in the Object Explorer and also delete the database here before SQL Server will recreate the files. Explicitly controlling the connection string for the Entity Framework is easy. You can pass a connection string to the DbContext constructor, or you can pass the name of a connection string that resides in the application’s configuration file. For example, the following code will make sure the Entity Framework connects to the local SQL Server default instance and use a database named departments. If the Entity Framework does not find a connection string named “departments” in you config file, it will assume you want a database named departments on the local SQL Express or LocalDb instances (depending on which connection factory is in place). Finally, if you do not pass any hints to the DbContext constructor, it will also look for a connection string with the same name as your class (DepartmentDb) in the config file. As you can see, there are lots of options the Entity Framework tries when establishing a connection. The goal of all this work is to make it easy for you to use databases, but when software is misconfigured or not installed correctly, all these options can also make troubleshooting a bit difficult. When troubleshooting connection problems with the Entity Framework the first step is to always figure out what server and database the framework is trying to use. If the problems are permission related, the next step is to find a way to make yourself a sysadmin on the server (or at least get yourself in the dbcreator role). If the problem is making a connection to a server instance that doesn’t exist, you can always explicitly configure a connection string for an existing instance of SQL Server. If all else fails, use SQL Server Compact, as nearly anything you can do with Code-First Entity Framework will work the compact edition of SQL Server. Great post. One thing you didn't mention is passing "name=blah" to the DbContext constructor. This forces DbContext to either use the connection string called "blah" or throw an exception if it is not found. It won't try to do anything by convention so you know that if it works then its using "blah" and not anything else. Another way to determine the connection string is use -Verbose from Migrations. When -Verbose is used we display the connection string and also how we sourced it - Convention, configuration etc. @Arthur - thanks for the name tip. You've just helped me out. Thanks for the excellent information. + 100 Kudos points. have added edm,svc. When browsing svc(or trying to add a service reference), I get:System.NotSupportedException: The property 'geom' on type 'soluri_DBO_sol' is of type 'Geometry' which is not a supported primitive type. Thank you, I couldn't figure out how to get rid of a deleted database. Knew something had to be referencing it somewhere. Kept looking in Server Explorer, didn't realize to look in SQL Server Explorer. Sigh. Hi Scott - great post. It helped me diagnose some issues I was having running LocalDB on a full IIS instance. Thought it was worth mentioning that it is a lot easier to install LocalDB from the Web Platform Installer rather than going through the SQL 2012 Express guided installer. Thanks!